White, Yellow, Lemon, Spice, Carrot, Light Chocolate, Devil's Food, Red Velvet and the newest... Royal Blue Velvet. 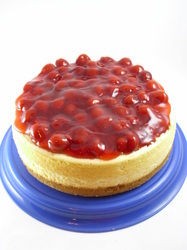 Cheesecake is awesome no matter how you dress it!!!!! Pictured is my 9 inch creamy baked cheesecake a graham cracker crust, one with with a cherry topping and one with "Turtle" (caramel, pecans and chocolate). I can do many variations like Raspberry topping with a chocolate cookie crust; Blueberry topping with a vanilla cookie crust, etc... I am open to ideas for a flavor you're craving. If I think I can, I will! This cake was done as a request by someone. This is a contrast transfer; It could be done with just about any image even your own. It can be done in a variety of colors and flavors. This cake was a appropriately done in a Retro Royal Blue velvet cake frosted with a savory White Butter cream icing and trimmed with a Chocolate Butter cream icing. Prices will vary depending on cake size and flavors. 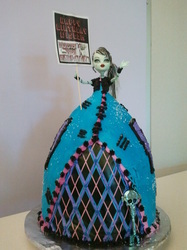 Monster High Doll Cake- "Frankie" Real doll inside the cake. Customer provided unclothed doll and accessories. I wrapped the doll in plastic to try to protect from food colors. Baked 3- 8" layer cakes and sliced them all horizontally to appear like 6 layers, vanilla Buttercream between all layers; then inserted 1.5 inch PVC plumbing tube in the center and sculpted cake in the shape of gown and then inserted doll in the tube and did fine detail with Buttercream. This cake was to feed 40. $75 plus you have to provide the doll. 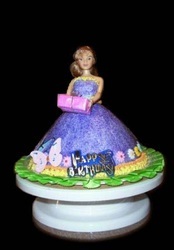 This "Barbie" Doll cake was done for my little girl's 10th birthday. 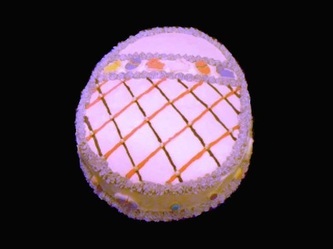 A Yellow cake with White Butter Cream frosting and Royal Icing Decorations. Not all decorations are edible. 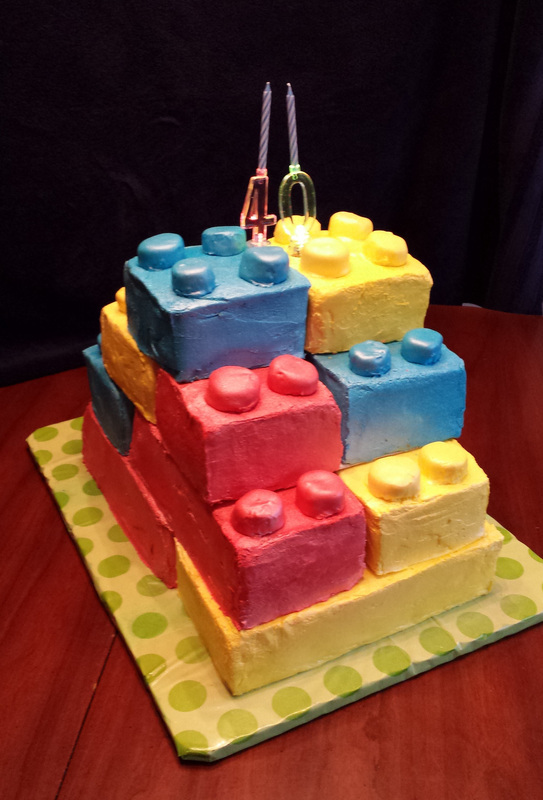 I made this cake for my husband's 40th birthday party. The bricks are actually different flavor cakes: Raspberry cake, Chocolate cake and yellow cake all with my homemade buttercream icing. This cake was done for Easter. It was Yellow cake with White Butter Cream frosting. 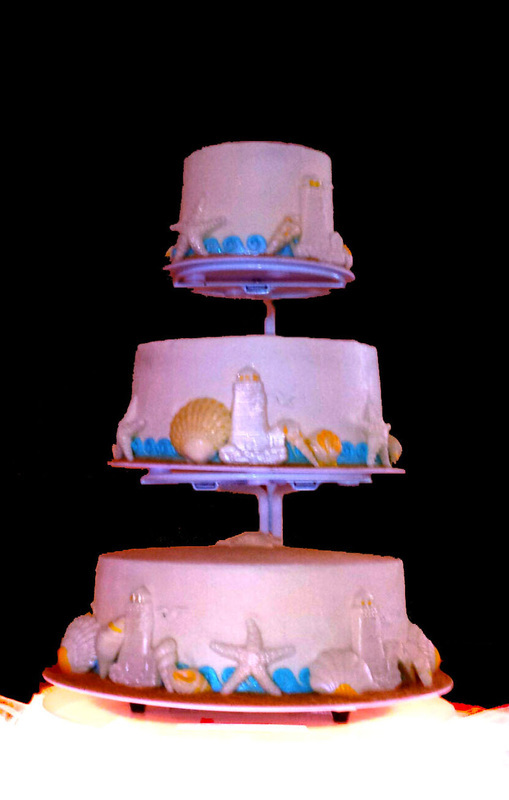 Beach themed Wedding Cake. It was Lemon cake and Raspberry cake layers separated with cheesecake, frosted with White Chocolate Cream Cheese Buttercream Icing and decorated with a Blue Modeling Chocolate Wave Border with Molded White Chocolate Light Houses, Shells, and Seagulls and edged with Brown Sugar/ Graham Cracker Sand. This is the third wedding cake I have ever made in June 2014. Price $5.00 per slice plus delivery and set-up charge; a cake stand, plates & miscellaneous rentals refundable fee applies for this cake. 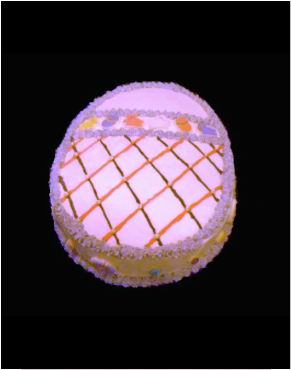 This is the second cake I made, August 2003. This cake was done for a mid-day wedding. 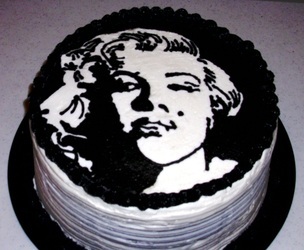 The flavor of the cake was spice and it was frosted with a White Chocolate Cream Cheese frosting. Price $3.50 per slice plus delivery and set-up charge; a plate, pillar & miscellaneous rentals refundable fee may apply for this cake. This is the fourth wedding cake that I've made, August 2014. It was made as a 25th Wedding Anniversary cake. Each tier was double layer cheesecake FLAVORED cake with each layer having a different filling 12”raspberry, 10” chocolate mousse, 8” Strawberry and 6” lemon. I Frosted the entire cake with my signature homemade White Chocolate Cream Cheese Buttercream. 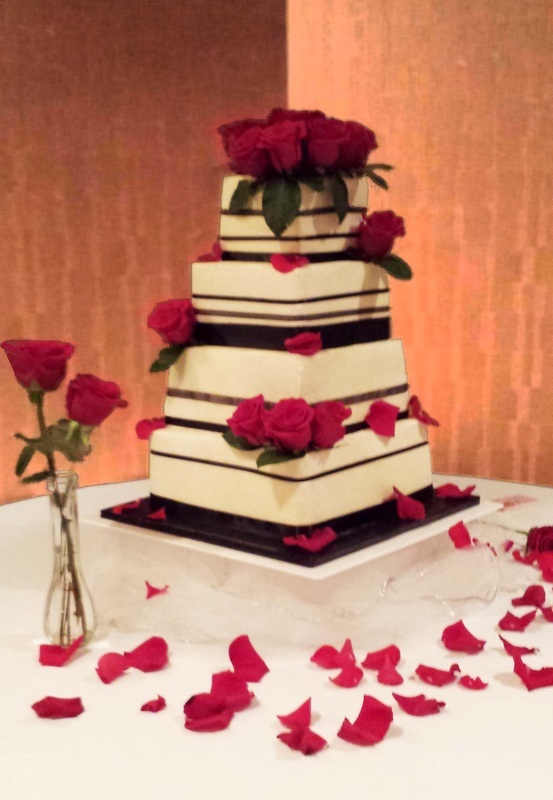 I then decorated the cake with several variations of black ribbon and fresh roses. 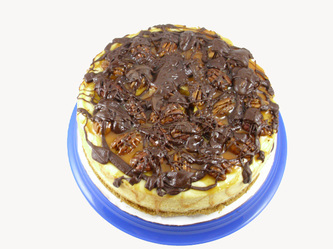 Price $4.50 per slice plus 18 red roses of your choosing. This exact size cake- $751.50 plus roses, delivery and set up. A miscellaneous rental refundable fee may apply for this cake. 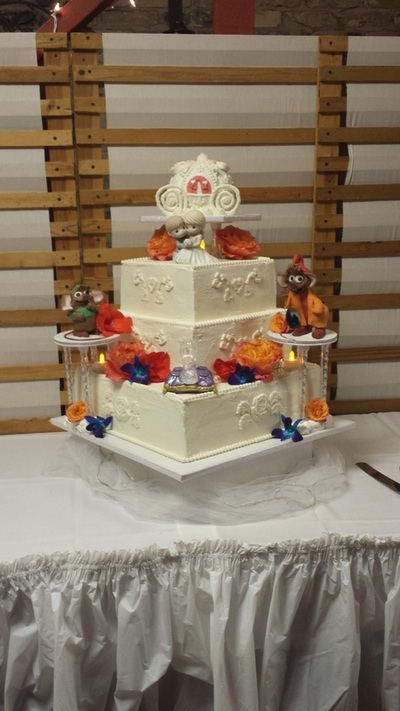 The fifth cake I made August 2014; Cinderella's Enchantment cake is adorned with her cute mouse friends (Jack-Jack and Gus) edible made of modeling chocolate, her edible glass slipper made of hot sugar sitting upon a rice crispy treat covered with modeling chocolate pillow. 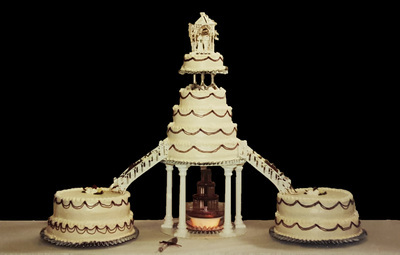 Her wedding coach (made as an anniversary cake) decorated with modeling chocolate and handmade white chocolate pieces. The entire cake was then dressed up with an array of fresh flowers similar to the brides bouquet and lit up with battery operated candles and twinkling lights below. Each side of the cake, made to represent her new castle enchanted with a baroque design made of modeling chocolate. The Precious Moments cake top was gifted to the bride, so we made it work. It is a Strawberry flavor cake with strawberry filling and frosted with my signature White Chocolate Cream Cheese Frosting. Price $9.50 per slice plus delivery and set-up charge; a plate, pillar & miscellaneous rentals refundable fee applies for this cake. 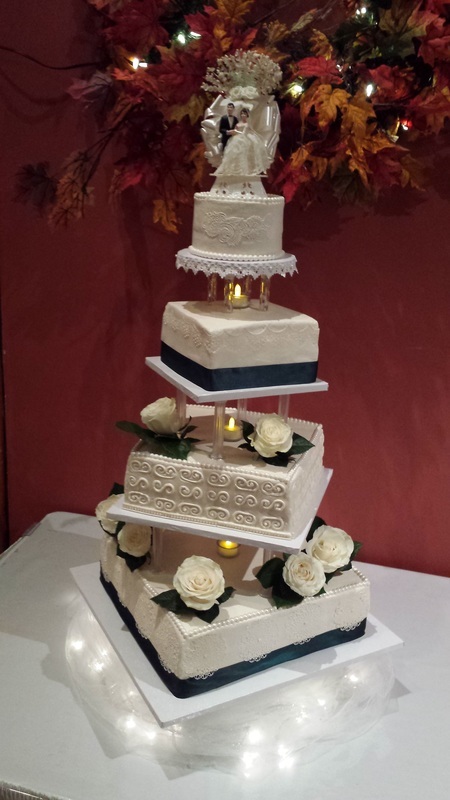 The sixth wedding cake I made, October 2014, was the tallest one! It was a Tiramisu cake; one layer of coffee flavored cake, one layer of white cake with a Mascarpone filling and then frosted with a delicate Kahlua homemade buttercream. When served, each slice was dusted with cocoa powder and 2 heart shaped pieces of white chocolate placed on top. The cake was decorated with hunter green satin ribbon, white chocolate pieces, Edible Sugar Lace, Modeling Chocolate, Fresh White Roses, and battery operated candles in glass holders. The cake topper on this cake was that of the bride’s grandmother from her cake 40 years prior. 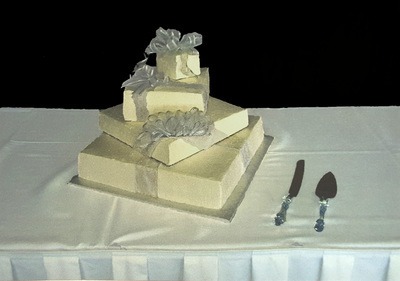 Price $6.00 per slice plus you bring cake topper delivery and set-up charge; a plate, pillar & miscellaneous rentals refundable fee may apply for this cake.